Town hall meetings, otherwise known as “all hands” serve many important purposes. These events provide company updates and keep everyone on the same page. They also give a employees an opportunity to be heard. What is a virtual town hall meeting? Organizations use a variety of technologies to deliver virtual town hall meetings to participants located in widely dispersed geographic locations. Budget conscious companies might just host a teleconference call or web conference. Moving farther up the scale are webcasts. Webcast technologies allow high-quality one-way video streaming of the speakers either from a studio or conference room with a video camera. Attendees can interact with speakers through polls and chat windows. 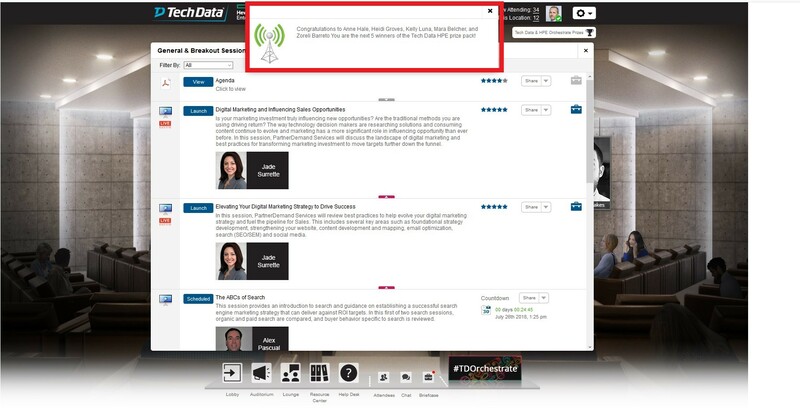 Large organizations, with more than 1,000 attendees, may need to make sure that the Webcast technology can integrate with Enterprise Content Delivery Services to make sure the internal corporate network can handle the volume of attendees (bandwidth) joining at the same time. The challenge with these delivery methods by themselves is that employees are used to an in-person meeting with lots of games/contests, photos, team bonding and cocktails. Also, high performing employees are used to receiving recognition in front of their peers, and not just on a conference call. Just hosting a webcast is quite limited on these fronts. To create a more engaging town hall event, organizations are increasingly turning to virtual conference platforms. Virtual Conference Platforms enable organizations to create an environment that feels completely custom and very “personal” to the attendees. For example, the welcome lobby can use an image of the organization’s actual office building lobby. A recorded video can automatically play upon entry from an executive to welcome attendees. The environment can be filled with quality content (documents, video’s, links to web pages, etc.) and a packed agenda. Finally, organizations can integrate and leverage internal tools that were already a part of employees’ day-to-day (e.g., Yammer for chat or an intranet). If employees are located in an office, they can join together physically from a conference room. What are the advantages of a virtual town hall meeting? Organizations are facing a increase remote or work-from-home employees as well as satellite offices. The ability to connect with these geographically dispersed employees is becoming more challenging than ever. Virtual town hall meetings require no travel for both the executives presenting as well as the attendees. Hosting a large-scale corporate town hall meeting at a physical venue can be incredibly expensive. Travel, airfare, food & beverage… the costs add up. Hosting a virtual town hall meeting will reduce your costs significantly. Encourage company executives to take an active role in your Virtual Town Hall. Encourage executives to be visible and have fun. Tip: One client created a video of the CEO’s dog talking (edited for effect). One of the rooms/locations within the virtual conference included the dog lying on the floor. When attendees hovered their mouse over the dog, they could click to watch the video. 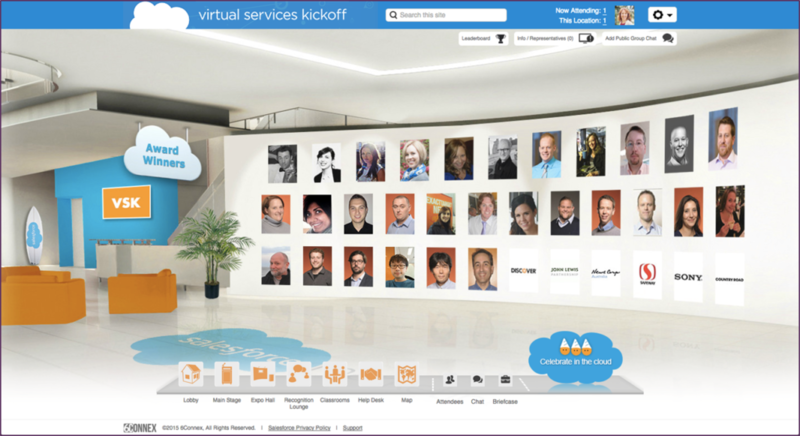 Another client created a “wall of recognition” room within the virtual conference. Once the keynote presentations ended, the photo wall room opened so employees can see photos of their peers that won awards. Dale Carnegie and MSW conducted a recent study of over 1,500 employees that found 71% of respondents were not fully engaged – and 26% were considered actively disengaged. The primary reasons cited involved a lack of belief in senior management and a poor relationship with the direct manager. Tip: Give your employees a voice by making use of polls, surveys and chat functionality throughout the environment. Organizations can also incorporate games with prizes to add a level of fun to the event. The Communique Virtual Conference Platform includes a unique gamification with Leaderboard feature. Leaderboard allows organizations to drive behavior while adding an element of fun with games and prizes. For example, meeting organizers can assign point values to relatively any activity such as attending live or watching on-demand presentations, visiting booths, chatting, participating in surveys, etc. One client hosted a virtual conference close to Halloween. They hid small images of candy corn throughout the virtual environment. Attendees were able to click on the candy corn if they found one and accumulate points towards prizes. Meeting organizers can leave the virtual town hall environment available on-demand for 30, 60, 90 days or as long as they want. Attendees can go back anytime and access conference content, view webinar recordings, download documents, view videos and link to web pages. Whether you host a simple Webinar or full virtual conference for your virtual town hall meeting it’s important that you can measure its success, particularly in terms of attendee engagement. Virtual conference platforms allow management to track participation, measure attendee engagement, give away prizes and generate data on every single action of each attendee (webinars attended, booths visited, how long, most popular content, videos watched, chats, surveys, etc.. Tip: Add signs that link to surveys throughout the virtual town hall environment. Also, when an attendee exits the virtual town hall platform, add a re-direct to the survey URL. For more information on Communique’s Virtual Trade Show software platform go to www.virtualtradeshowhosting.com. Article – What is a Hybrid Event?